New York Car Insurance Requirements « Car Insurance Calculator – Car Insurance Estimator for You! Drivers must also obtain Personal Injury Protection (PIP) coverage of a minimum of $50,000 for medical expenses for you and your passengers in an accident. (cf. also the next section for more information). Nearly all car insurance policies have a provision that will adjust your coverage from the minimums required in your state to the minimum insurance or proof of financial responsibility in another U.S. state. So you do not need to get a new insurance policy for each state you are driving through. However, if you buy a policy in a low limits state (like New York or Kentucky) but live in a high limits state (like Alaska), insurers will only write a policy where your car is principally garaged. So if your home is in Alaska, you should buy the minimum limits for Alaska. New York’s required insurance limits are low, considering the cost of repair and damages likely to occur in an accident. If you are in a serious collision and the damages you caused are greater than the coverage limits you purchased, you may be personally liable to pay for those damages that exceed your insurance coverage. As rates in New York, and especially New York city may be high, we recommend our special guide to New York City. New York is a “No Fault” state. Your PIP coverage can cover medical expenses and lost wages suffered by you and your passengers. However, if the injuries you cause in an accident are serious, the injured person retains the right to pursue a tort claim. For such claims, New York is a comparative negligence state. A comparative negligence legal defense is one that reduces the amount of damages that a claimant/plaintiff can recover for an injury due to negligence based on percentage of which the claimant’s/plaintiff’s own negligence contributed to cause the injury. So, if you have an accident, you and the other driver could be each at fault for 50% of each others’ damages. However, just because you have the same percentage of fault, does not mean you “cancel” out each other damages. You will have to pay for 50% of the other driver’s damages. So if you total their $50,000 car, you will be liable for ½ of the damage you caused – $25,000. 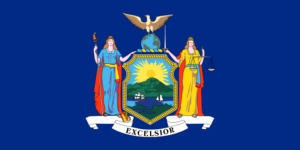 In New York, a first time offense of Driving While Intoxicated (DWI) is a misdemeanor offense. If you are 21 years or older, if you have a Blood Alcohol Content (BAC) level of .08% or higher while driving, New York law presumes you are driving while intoxicated. If you are under 21, a lower BAC may apply to you. If convicted, you may be sentenced up to 1 year in jail – and if convicted of a DWI with a child passenger under age 15, you may be sentenced for 1 to 4 years in jail. A court fine of $500-1000 may be imposed, with other penalties of $75-$100 each and a surcharge of $250 per year for three years. You will also be responsible for your cost of incarceration. Your license will be suspended or restricted for 6 months. You will be required to install an ignition interlock device. You will also be required to take attend and pay for Victim Impact Panel. SR-22 or FR-44 forms will be required for a 1st DWI. If convicted, you may be sentenced up to 1 year in jail – and if convicted of a DWI with a child passenger under age 15, you may be sentenced for 1 to 4 years in jail. Fines may be imposed from $1000 up to $5000, with other penalties of $75-$100 each and a surcharge of $250 per year for three years. You will also be responsible for your cost of incarceration. Your license will be suspended for 1 year. If you are eligible for a restricted driver’s license, you may be required to install an ignition interlock device for up to 2 years after obtaining a restricted license. You will also be required to take attend and pay for an Victim Impact Panel. SR-22 or FR-44 forms will be required for a 2nd DWI.